Portland Cello Project's Skip vonKuske hosts his weekly The Guest List at McMenamins Edgefield featuring folky accompaniment from Seth Bernard and Daisy May, 7 PM. 21 and over. Loud rock from A Place To Bury Strangers at The Woods, 6 PM. 21 and over. Country rock with Huge Sally in the lounge at the Hawthorne Theatre, 8 PM. 21 and over. So much St. Patty's Day action at all the McMenamins locales. Try Edgefield, Grand Lodge, Hotel Oregon, and Kennedy School for big parties or general consumption and music at Rock Creek Tavern or White Eagle Saloon. Starting as early as 4 PM, mostly 21 and over. Punky, pop, rock with The Middle Ages, Therapists, and The Chemicals at Kelly's Olympian, 10 PM. 21 and over. The Portland Cello Projects starts making their rounds on McMenamins' Great Northwest Music Tour with the gymnasium at the Kennedy School, 7 PM. All ages. Lotta electro dance beats at the Afterlife Dance Party with DJ Deafchild, Quillan, Miss Margo, and Mortal Grey at The Woods, 9 PM. 21 and over. Quirky rock with Miss Massive Snowflake at Music Millennium, 6 PM. All ages. Bluesy rock with The New Americans and Stuck Runnin' at Sana's Bar and Grill, 7 PM. All ages. 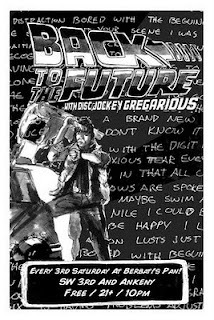 Pure, unadulterated 80's with Disc Jockey Gregarious at Berbati's Back to the Future, 10 PM. 21 and over. Funky rock with Break As We Fall at Jolly Roger, 10 PM. 21 and over. Folky acoustics with James Faretheewell at East Burn, 10 PM. 21 and over. Indie stuffs with Bombs Into You, Iretsu, and Grey Anne at Rontoms, 9 PM. 21 and over. Wrapping up an Irish week, McMenamins Rock Creek Tavern brings you Irish Music Sunday with Hanz Araki and Cary Novotny at 6 PM. All ages. Followed by the same duo at Biddy McGraw's, 8:30 PM. 21 and over.